Trek through the Kali Gandaki Gorge (2,520 m/8,270 ft.) all the way across the Thorong La Pass (5,416m/17,769ft). 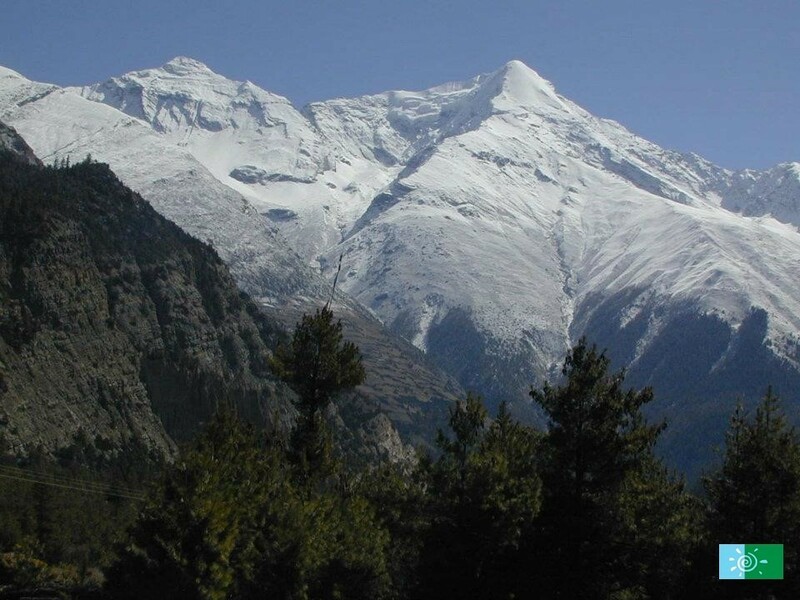 Trek around the world’s 10th tallest peak, Annapurna Circuit Trek offers you ample diversity. Diverse flora, fauna, rivers, waterfalls, cultures, traditions and lifestyles. Opportunity to experience different trek through isolated/different routes amongst the local cultures. 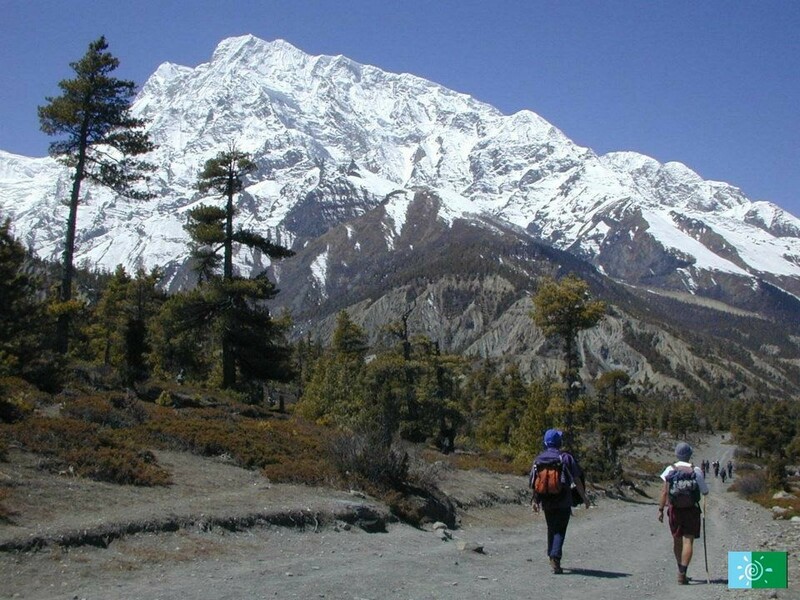 The Annapurna Circuit is a trek within the Annapurna mountain range of central Nepal. 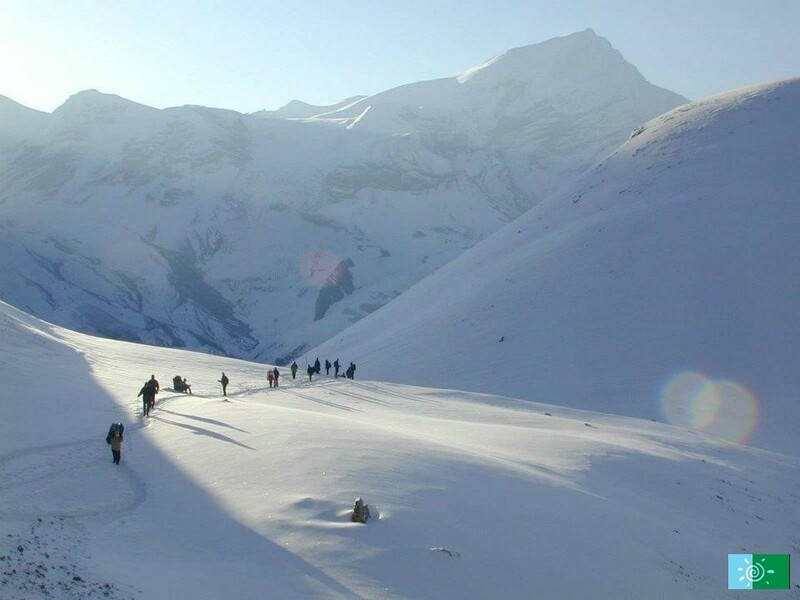 Annapurna Circuit trek is considered as one of the best long treks in the world. 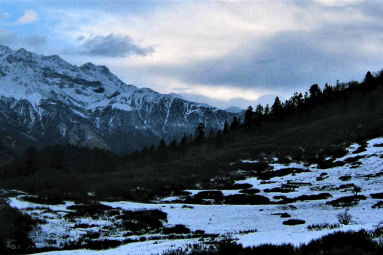 Annapurna Conservation Area Project (ACAP) completed alternative trekking route in 2006 and named them NATT (New Annapurna Trekking Trails) and finally back in 2012 NATT was renamed to Natural Annapurna Trekking trail. Nepal Sanctuary Treks use new NATT trail to trek to south of Annapurna and to avoid the road. 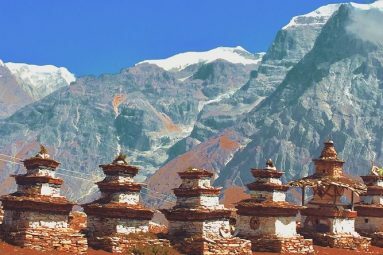 The scenery is outstanding with a wide variety of climate zones from tropics at 600m to arctic at 5416m at the Thorong La pass and cultural variety from Hindu villages at the low foothills to the Tibetan culture of Manang Valley and lower Mustang. Annapurna Region offers a true cross-section of Nepal from lowland rice plantations, deep forest, snowcapped mountain range, with beautiful sunrise and sunset view to the arid terrain in the Himalayan rain shadow. Trekking with us will give you the opportunity to experience different trek through isolated/different routes amongst the local cultures. 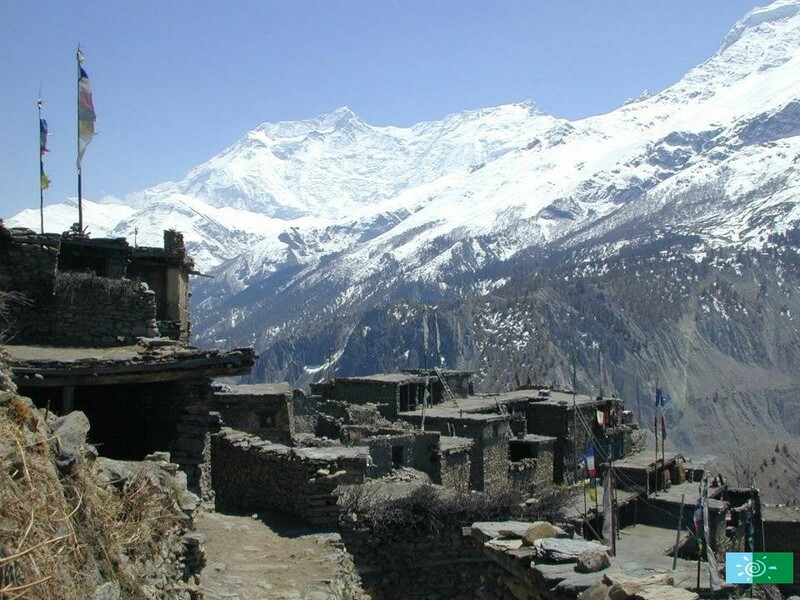 Annapurna Circuit Trek also takes us to Manang, Jomsom and the Muktinath region which again gets us acquainted with the diverse Nepalese landscape and culture. Day 03: Kathmandu – Besi Sahar (760m/2,493ft) – Syange (1,100m/3,608 ft.)Drive 8-9 hrs. Early morning after breakfast, we will head to Besi Sahar on a private vehicle arranged by the company. A long scenic ride offer spectacular mountain views. Passing the village like Khudi, Bhulbhule, Ngadi takes you to Syange where we stay overnight in a lodge. Pass through rice fields, rain forest and river. The following morning we make our way towards Tal. Take a steady ascend along the motorway and after taking descend you will arrive at Jagat and trek towards Chamje where we will stop for lunch. Further take descend trail along the Marsyangdi River and cross the suspension bridge. As you ascend you can see the cliff onto other side of the trail. Take an additional steep climb up to top from tea house. The top ridge is the border line of Manang and Lamjung. We will enter the valley of Manang district. Then trek through easy trail all the way to Tal. Tal is a beautiful village, mainly made up of lodges and old houses. Behind the village is a huge waterfall which will offer nice photo opportunities. After breakfast, we walk an easy trail and cross the suspension bridge. Further take ascend and trek through motorway where you reach at Dharapani. Your TIMS permit will be checked by police at Dharapani Bazaar. Then, pass Dharapani and take steady climb up to Danaque. 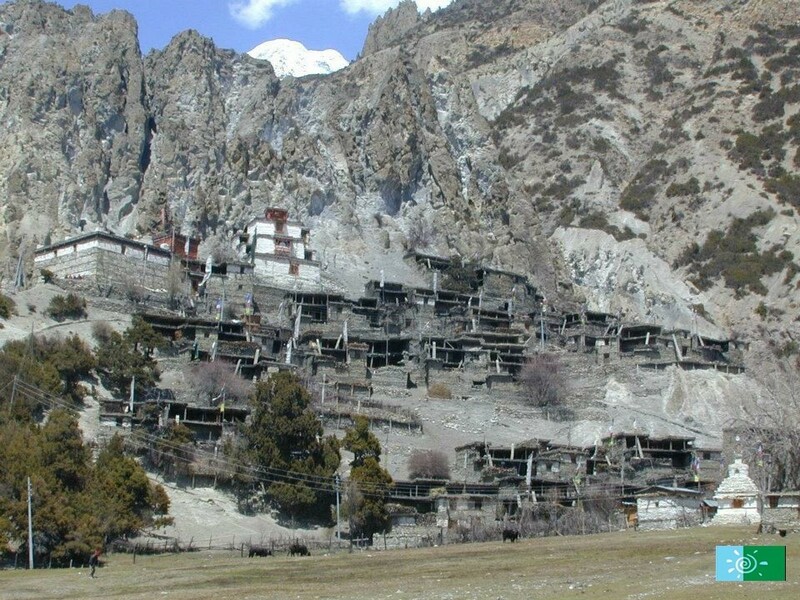 Danaqyu is a long village stretched over more than 1km with several lodges. Walk through pine forests, local villages and apple orchard. After breakfast, we take ascend and follow the south bank of the river climbing to Syal Khola (the river of jackals) at 2210 meter, after which we will cross the river over a cement bridge . Further take steep ascend through forest of walnut trees and landslide areas. Then you reach at Temang village, where you can see the great views of Lamjung Himal (6,983m), Annapurna II and Annnapurna IV. The climate and vegetation will change once you arrive at Temang. Then follow motorway passing several local villages, pine forest and fields all the way to Chame. Chame is a district headquarter of Manang with a bank, police headquarters, district administration. After breakfast, we leave Chame behind and trek towards Pisang. On the way you will see the first glimpse of Lamjung Himal. Further cross the Marsyandi River via suspension bridge and walk through planted fields to Teleku and Bratang. You can see a huge apple orchard in Bratang run by community. Here, you can refresh yourself by drinking organic apple juice. Further trek through level path crossing Marsyandi River. Our path steepens as we climb passing teahouses and reach at Dhikur Pokhari. 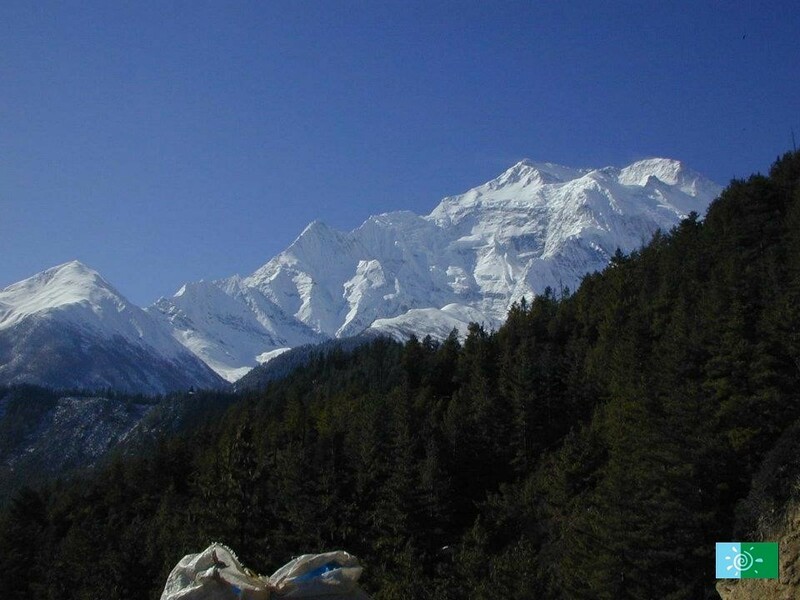 We will stop for lunch and enjoy the close view of Pisang peak, Annapurna II, IV and several other unnamed peaks. After lunch, again walk on level path and cross another suspension bridge. Once we take a final ascend we reach our today’s destination, Upper Pisang. Today, leaving Pisang we trek to major villages of Manang district, the environment will become colder and drier as we climb upwards. There are two ways to reach Manang; we will take the upper trail that offers us the best views of the mountains, if you wish to take the lower trail it will take (5hrs) to reach our destination. From Pisang we walk through levelled trail then steep climb up to Ghyaru where you will come across with beautiful chorten. Overlooking the valley with perfect vistas of Annapurna III, IV, Chulu Far east, Pisang peak, Gyaru is a typical village with most houses having flat roofs. Ghyaru is bounded by several fields of buckwheat and barley and gompas. Further walk a level path and from the top of the ridge, you can see grand views of Humde village with its short air-strip and the great peaks of Gangapurna, Annapurna II & III, Tilicho and on the right Chulu east, on the back Pisang peak. and mountaineering school. Walking further you will reach at Ngawal where we stop for lunch. After lunch we take a shorter descent to rejoin the main trail and continue to trek towards Braga where you can see traditionally built up Tibetans style of houses and if can be visited the monastery, it has an exceptional display of sculptures, beautiful masks and Thanka, and the sacred manuscripts. After an hour walk you will arrive at Manang for the overnight. Birds-eye view of Humde village with short air-strip from the top of the ridge. Rocky cliffs and not so much trees as you reach Manang. Today is an important day for acclimatization as the next few days we will trek in higher altitudes and altitude sickness can be a problem. 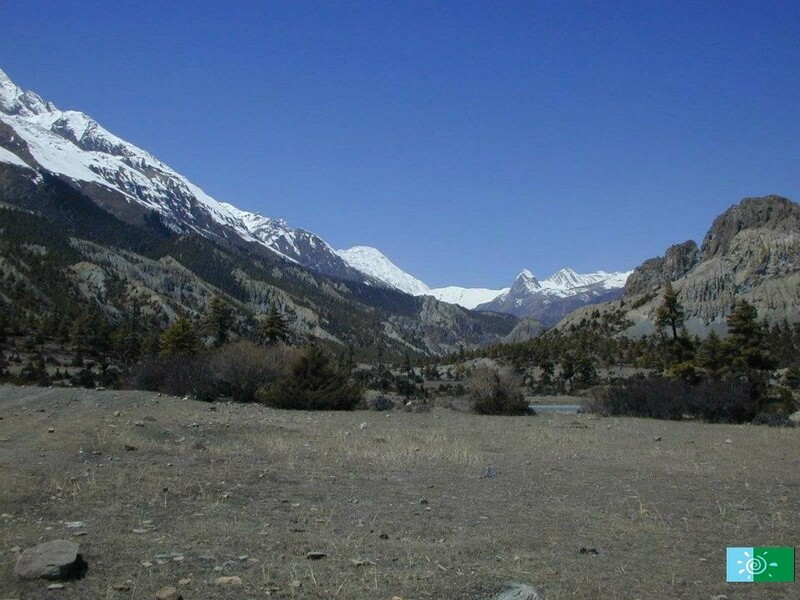 Day treks around Manang will be organized today, the best options for today’s trek is Gangapurna Lake, the turquoise glacial lake from the Gangapurna glacier. For acclimatization, we hike above the lake where there is a Chongkor viewpoint which offers spectacular mountains views and the majestic Gangapurna Lake itself. After hike, we will be back to lodge for lunch. Observe Yak, blue sheep along the way. If you are lucky you might encounter with snow leopard. Spectacular view of Annapurna II, Annapurna III (7,555 meters), Gangapurna (7,454 meters) to the South – Tilicho (7,132 meters) and the Grand Barrier to the West – Chulu West (6,583 meters) and Chulu East (6,059 meters) to the North. After an early breakfast, we head towards Yak Kharka. 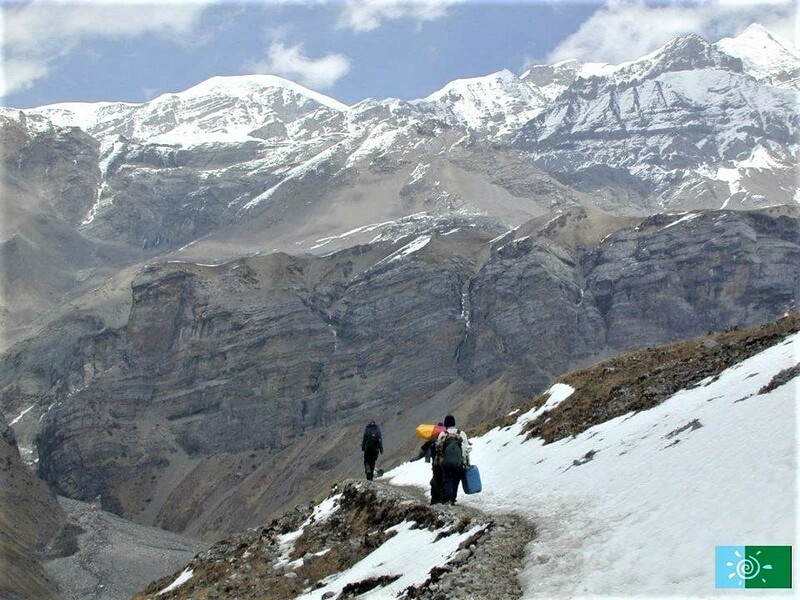 The trail takes to a steady ascend to the Tenki Manang for closer vistas of the Annapurna, Gangapurna and Tilicho peak. 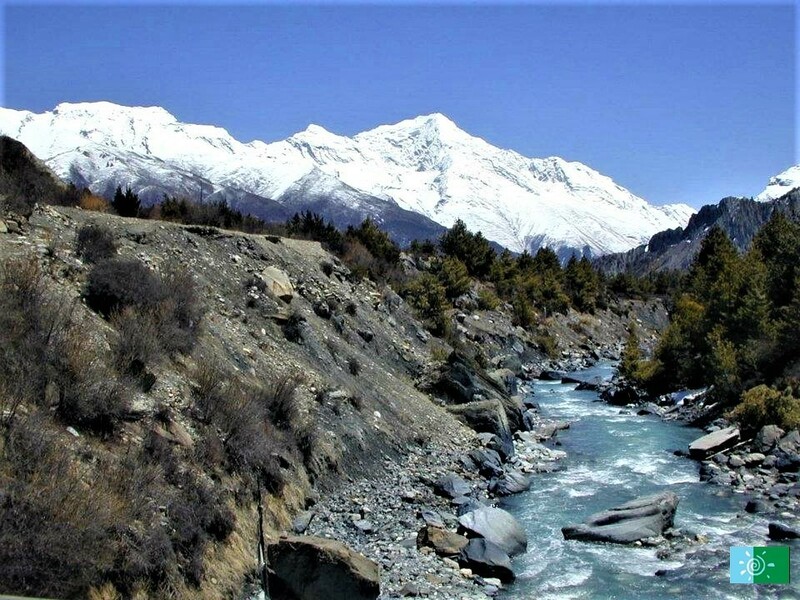 The trail slowly winds up offering awe-inspiring vistas and through terrains with juniper bushes and trek further up to finally reach Yak Kharka. 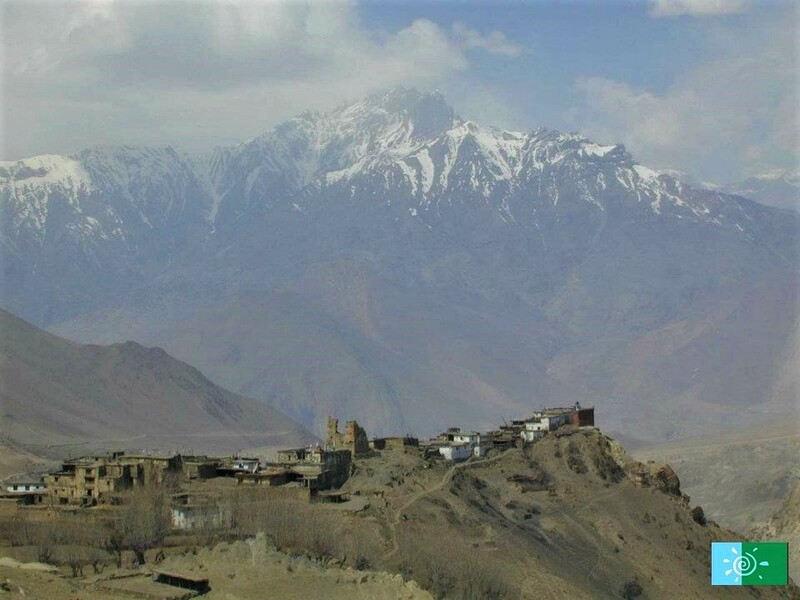 Since it is shorter trek today so that it helps everyone in acclimatization and reaching Yak Kharkha earlier will give us the opportunity to explore around the village. We can either walk up the valley and back to the lodge or climb the ridge behind the village. We will rest the night here. Today is another short trek day; the trek takes us to the foot of Thorang La Pass at Thorang Phedi. From Yak Kharka, you feel a steady rise in the trail. After an hour walk takes you to Ledar and continue to take easy climb along the east bank of the Jarang Khola to Thorung Phedi. Further, we follow a narrow trail across a high, unstable slope crossing landslide and stone fall area before moving to Thorong Phedi. It is advised to be very cautious while crossing these areas. Once you reach at Thorong Phedi, you can either hike up to Thorong High camp for acclimatization or rest in Thorong Phedi. We will leave Phedi early in the morning for the challenging trek through Thorong La. Crossing the pass early would be a better idea as the weather can affect the trek during noon, it will take us 4 to 5 hours to reach the pass. 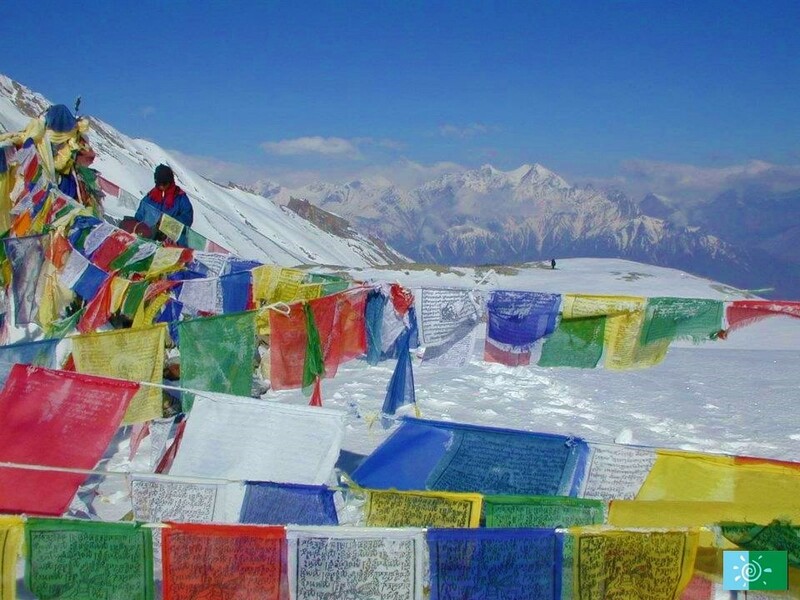 At the Thorong La pass, with its traditional prayer flags and stone cairn you will have outstanding views. You can enjoy the view of the Annapurna, Gangapurna and Khatung Kang, a heavily glaciated peak. You will reach a tea shop from where we start to descend. After the trail becomes less steep we will enter grassy fields and cross pastures where you can see the view of Dhaulagiri range and several other mountains. Finally we arrive Muktinath where we will stay overnight. Cross Thorong La Pass (5,416m), the highest point of Annapurna Circuit Trek. Capture the moment in your camera and explore the area. 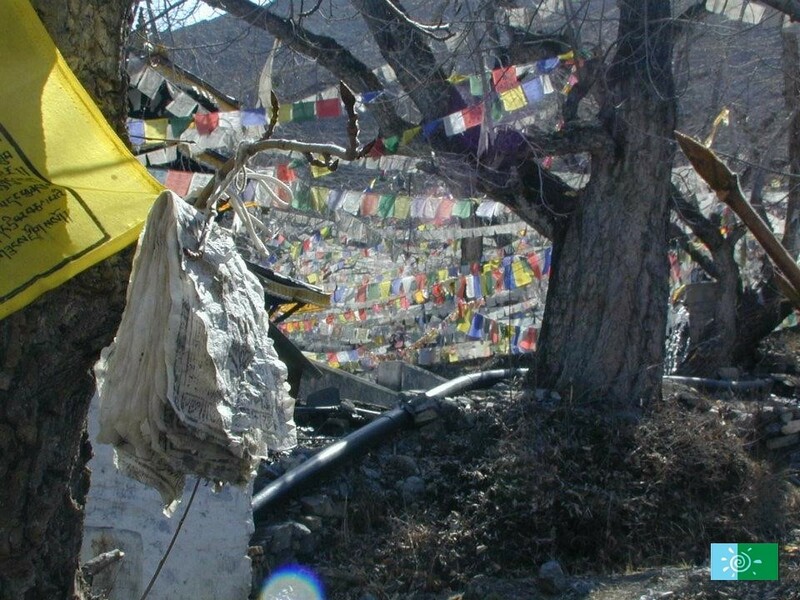 Muktinath is a popular pilgrimage among Hindu and Buddhist devotees of Nepal and India. The temple attracts thousands of devotees annually. Walk on your own pace viewing with sunrise and glimpse of the mountains. 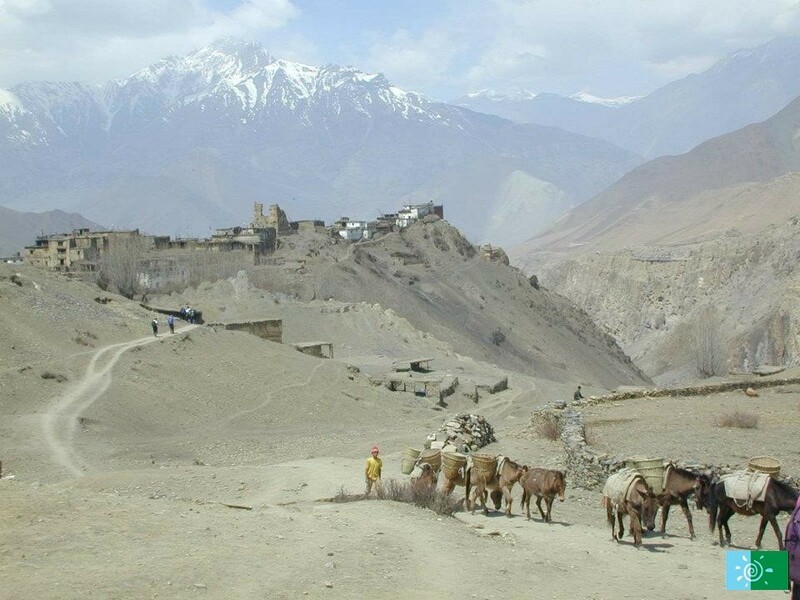 Picturesque scenery and down to the Mustang part of mountains and the Kaligandaki valley far below to the West. We will have an early breakfast and walk up to the airport nearby the hotel in Jomsom. After a short flight we reach Kathmandu and will have free leisure time either to rest or explore Kathmandu Valley, you will stay the night in Kathmandu. 1 . 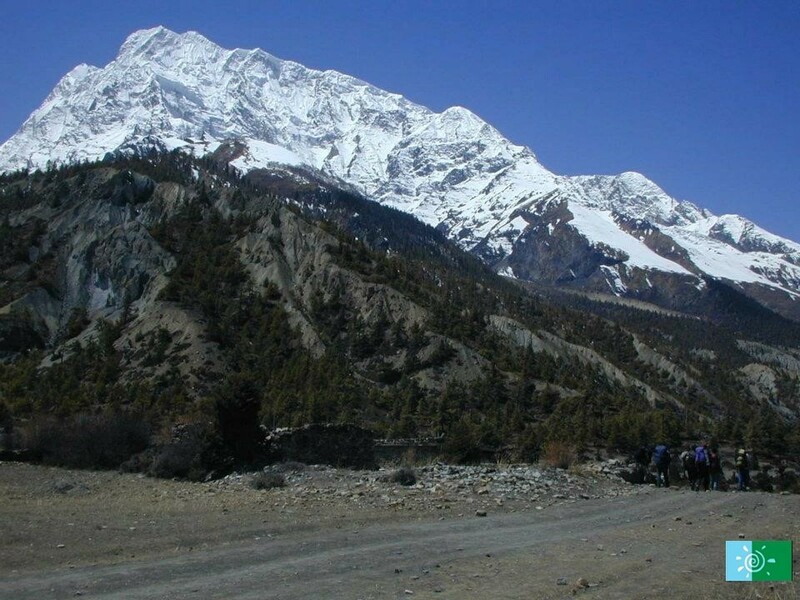 Why choose Annapurna Circuit trek ? 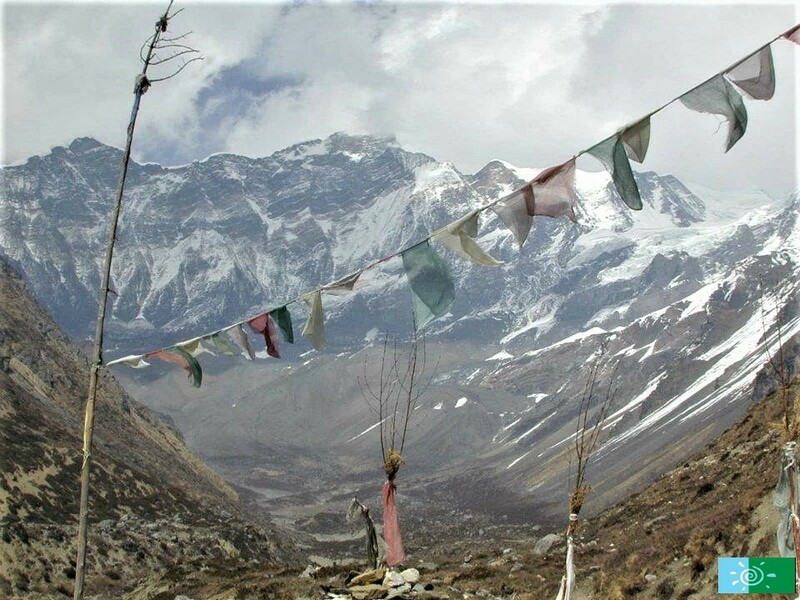 The Annapurna Circuit is a trek within the Annapurna mountain range of central Nepal. The trek is considered one of the best treks in the world as because of the scenery the trek offers. 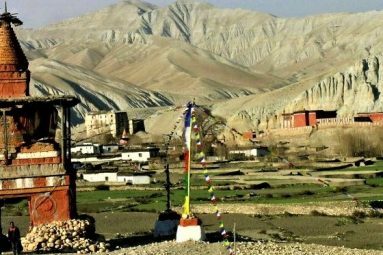 You will trek through a wide variety of climate zones and cross Thronog La pass, experience Tibetan culture of Manang and lower Mustang. The trek offers much more than just trekking. You will be walking for minimum of 5 – 7hrs a day, you don’t have to really fit but the minimum level of fitness is required as the trek is not an easy one. You do have to be healthy and mentally prepared for trekking in this region although it doesn’t require mountaineering skills. You can bring as much as clothes you want but extra luggage is not required for the trek, you can leave your extra luggage in Kathmandu or Pokhara’s hotel. For the trek you can carry enough clothes you require in your backpack or carry only the camera, water bottle few clothes etc in your backpack. The potter can carry your extra duffle bag clothes which can weigh up to 15 to 30kg and a camping porter carries up to 30kg. However the local domestic flights allows maximum of 18kg per person. 9 . 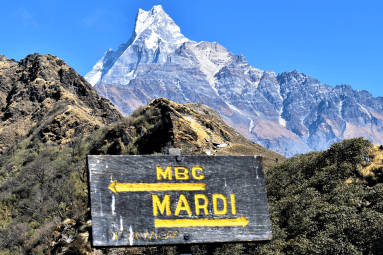 What medical facilities are there on Annapurna Circuit trek? In case of emergency you need to get evacuated by helicopter to Kathmandu, you need to take proper care of your health. Anyways, you will find small clinics along the trek, one at Manang and other at Jomsom (these clinics only check minor sickness). 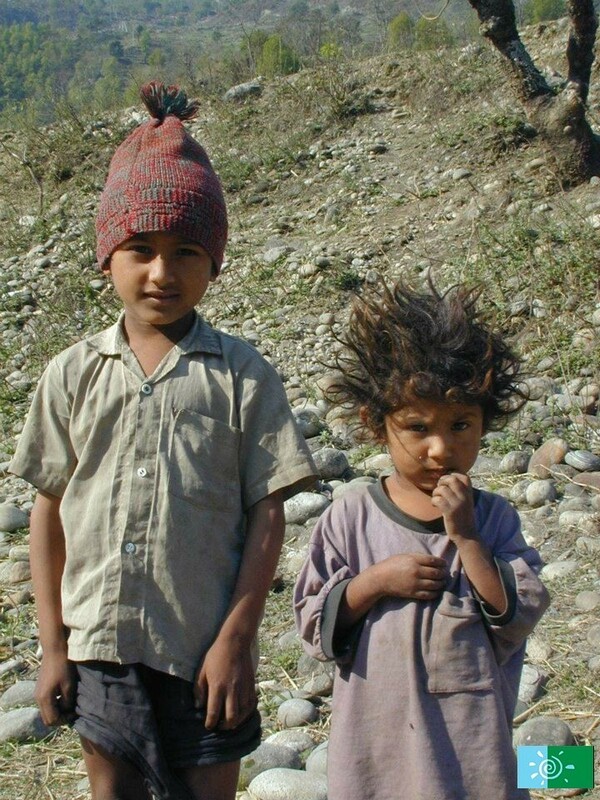 However, you need to bring your medicine (if any) and a first aid box will be provided by Nepal Sanctuary Treks, also your guide will be trained for first aid in case of emergency. We returned to the UK all intact and have returned to work but still remember what a fabulous trek we had to ABC. A big thank you to you and to Gopal for looking after us so well. It was truly a trip of a lifetime and made all the better by having such competent, professional and personable guides. I am already thinking about what is next and I would like to consider something a bit more adventurous but need your advice. I have always rock climbed and managed a little ice climbing about 30 years ago!! What sort of expedition would you recommend that might include a low-level peak or something a bit more technical? Max Elevation:5,416 meters /17,769 ft.